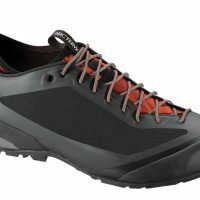 Why does a climber need a different shoe just to get to the base of the route instead of just using a hiking boot or shoe? Climbers access cliffs and boulders through steep terrain that includes scree slopes, slabs and fourth class scrambling with occasional fifth class moves. Running shoes or hiking shoes may suffice right out of the parking lot, but having an approach shoe with rock climbing prowess lends confidence and peace of mind as the steepness of slope and amount of stone increases on the way to the objective. Sticky rubber soles, a tight fit (with to-the-toe lacing), and toe rands are some of the climbing specific features that may adorn approach shoes. 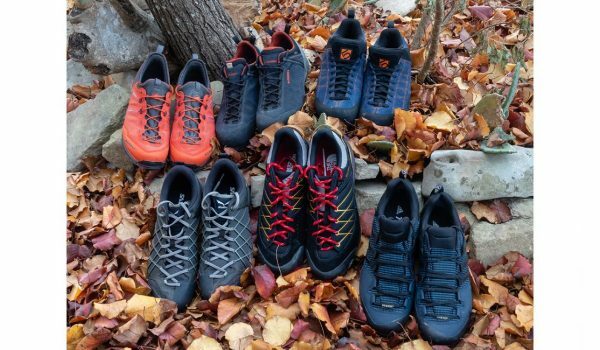 Our research involved 10 approach shoes from varying manufacturers; some are longtime climbing shoe producers, some make alpine or hiking footwear, some come from the outdoor apparel segment, and some are athletic shoe giants. Each manufacturer exercised different design angles; their shoes displayed strengths and weaknesses which became apparent with varied terrain, loads, and speed pursued. We chose these six models as they represented a wide swath of design philosophies and styles by manufacturers from diverse segments of the outdoor industry. We tested the six varying styles of approach shoes over the course of two months during personal and guiding trips in sport climbing areas across the US and during a mountaineering trip to Central Mexico. Temperatures ranged from the mid-40s to the mid-80s, and terrain ran the gamut from deserts to alpine, both dry and wet. Seiji Ishii did all the testing; he is an AMGA certified rock climbing guide who has been pursuing all types of vertical ascent since the 1990’s. 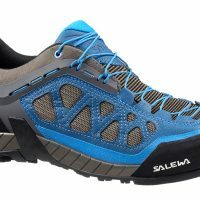 The Salewa Firetail 3 is a supremely comfortable approach shoe built on a stable platform that checks all the boxes for use in warmer and drier conditions. The shoes produced zero hotspots, even during super steep and long approaches and the traction provided confidence on rocky surfaces. This approach shoe is hard to beat for three season approaches in temperate zones that don’t demand much small crack or shallow pocket jamming. The La Sportiva TX2 is the nimblest approach shoe of the test; its sock like fit, flexible nature and sticky outsole urge you to almost run to the cliff. The polyester knit upper, soft injection molded midsole and sticky rubber outsole prioritize swiftness over protection to favor light loads and moderate trails. Arc'teryx flexes design muscle with this shoe, bringing unique construction to this category. A thermoformed, seamless one piece upper is mated to a stretchy “Adaptive Fit” inner bootie to create a sock like fit that effectively eliminates foot to shoe friction. The injection molded EVA midsole and molded foot bed offer great support and impact protection but the corresponding stiffness hinders climbing ability of the Acrux FL. The Five Ten Access Stealth S1 rubber outsole grips slabby rock like no other and the close, technical fit reduces slop and gives great feedback while making aggressive moves on the way to the cliff. This shoe excels on more technical and demanding approaches, offering sensitivity and traction as the angle steepens on rocky surfaces and fifth class moves pave the way. 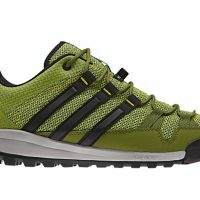 The Adidas Outdoor Terrex solo is a softer approach shoe, providing great sensitivity and traction for climbing, thanks to its Stealth rubber forefoot and toe cap. 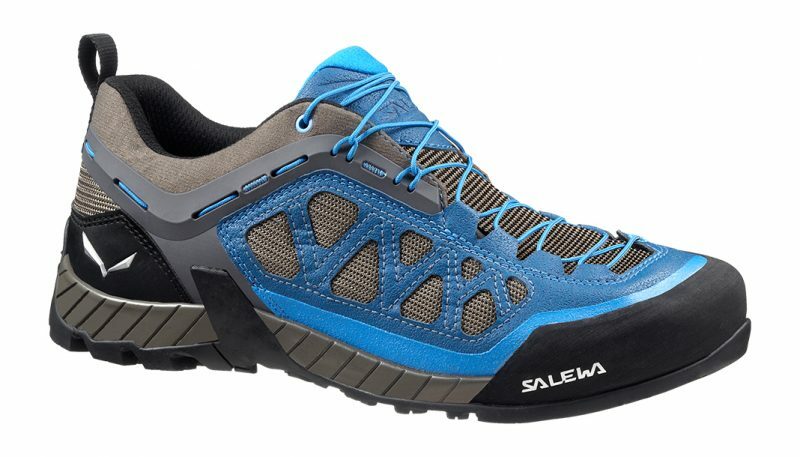 When trails are hard and dry and the base of the climbs lie above slabs, this shoe excels. The flat and low profile provides stability but the midsole composition and thickness can allow some pressure from small stones and pointy obstacles, especially under heavier trad climbing loads. 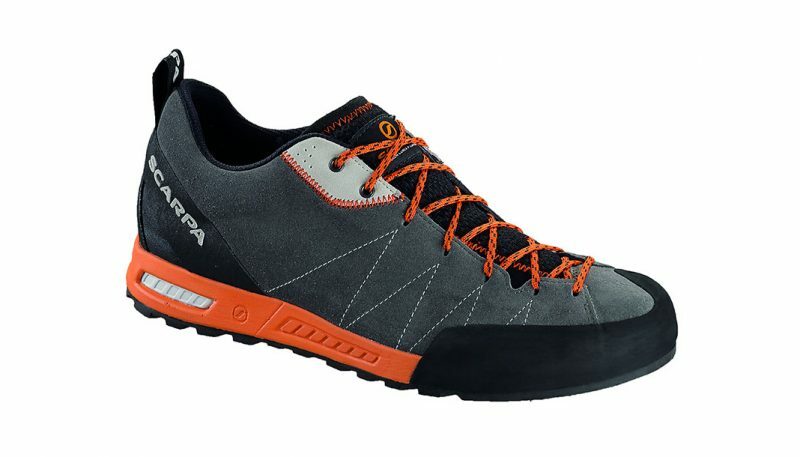 The Scarpa Gecko is a classically designed approach shoe as more of a climbing shoe with hiking ability. Traction, sensitivity and flexibility are excellent on stone but the trade-offs are limited support and protection on the trails. The Salewa Firetail 3 was the clear winner in the Support/Stability rating. The flat profile, wide and straight last, and the extended lacing system that integrated with the 3F Total System yoke firmly planted foot to shoe and shoe to the ground. Sidehills, angled slabs, uphill and downhill, the Firetail provided a confidence-boosting foundation. Other shoes also had low heel drops and straight lasts, but the Firetail’s integrated lacing and yoke system did a great job of welding the foot to the shoe which created a secure, unified feeling. 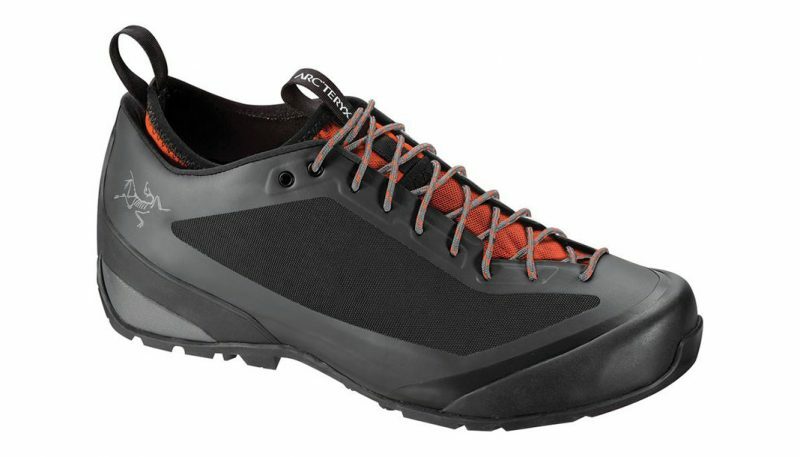 Shoes that had large heel drops (Arc’teryx Acrux FL) suffered some instability regardless of other factors as did shoes that had pliable uppers, narrow lasts and soft midsoles (La Sportiva TX2). The Arc’teryx Acrux FL far and away offered the most protection. The stiff midsole warded off stone bruises and potentially injurious impacts from boulder hopping. The single piece polyurethane mesh upper thwarted light precipitation well, was impervious to abrasion and the low friction surface allowed the foot to glance off objects instead of sticking. The stretchy sock liner added some padding and allowed the foot to slide inside the shoe in response to hits, reducing impact forces at the foot. Finally, the molded heel and toe cap added to the overall impact protection. All this came at the cost of climbing ability and sensitivity. The other shoes played the other side of the coin, scoring higher in other areas in exchange for substantially less protection. Both the Salewa Firetail 3 and the La Sportiva TX2 scored the same in the comfort rating; the Firetail 3’s incredibly comfortable interior refused to produce hotspots while the close-fitting, flexible and nimble TX2 felt like a glove for the foot. The slight edge goes to the Firetail 3, it’s stability lending more confidence and thus more comfort when the ground was far from flat. 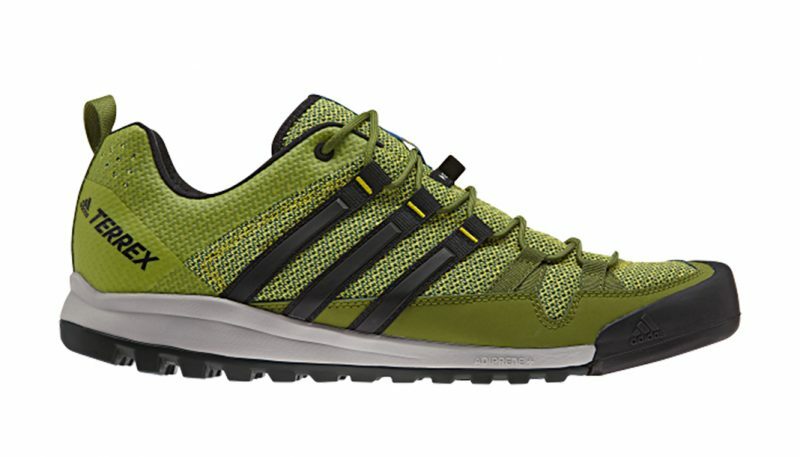 The Adidas Outdoor Terrex Solo was next in line, the broken-in feeling present right out of the box and the roomy toe box allowing for swelling and climbing shoe induced sore feet. The Five Ten Access and Scarpa Gecko were next in the comfort ratings; both used leather uppers that became more supple and form-fitting as the miles piled up, but they suffered in the heat due to lack of breathability. The Scarpa Gecko gets the nod over the Five Ten Access, as the lacing exoskeleton on the latter could cause pressure points. The Arc’teryx Acrux FL occupied the last spot in comfort, mostly due to the stiff nature of the entire shoe. The Arc’teryx Acrux FL and La Sportiva TX2 earned identical scores in this rating category, but the Acrux FL led the way, having extremely high-end materials and impeccable construction quality. The seamless, thermo-laminated upper was ultra clean, nothing but smooth transitions at every bonding site. The La Sportiva TX2 also displayed amazing construction quality, the seamless woven upper and its protective overlays executed cleanly. Even the laces were obviously of high quality. The Scarpa Gecko took the next spot; the old school full leather upper and approach shoe design harnessed a less modern but equally effective approach to quality, creating a long-lasting product. The Salewa Firetail 3 occupied the fourth quality and construction position, and although it is a high-quality approach shoe, it was the first to show signs of “mass production issues.” Little errors made their appearances, like missed stitches and visible glue. 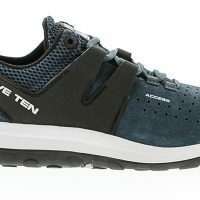 The Five Ten Access and Adidas Outdoor Terrex Solo tied for the last spot in this rating category, further signs of large-scale mass production visible in each shoe, similar to mass-produced athletic shoes. Their tied position wasn’t surprising as they are sister companies. 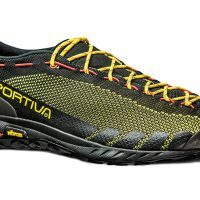 The La Sportiva TX2, Five Ten Access, and Adidas Outdoor Terrex Solo all scored identical points in the performance rating, based mostly on their climbing prowess. 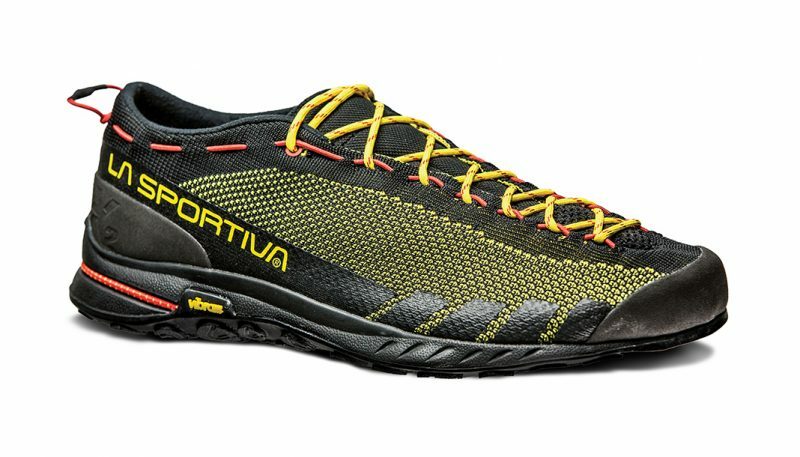 The La Sportiva TX2 gets the lead position by a slim margin, it fit closer and was more nimble feeling that the others. 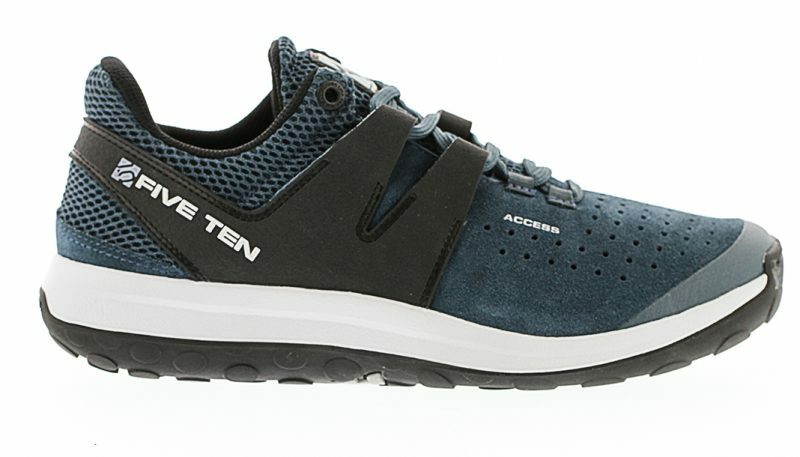 The Five Ten Access was next, the full Stealth S1 rubber giving it more traction on stone than the partial Stealth rubber outsole on the Terrex Solo (which had better traction on dirt). The Salewa Firetail 3 and Scarpa Gecko were next in the performance rating category, and the Firetail 3 nudged ahead of the Gecko due to better walking ability on angled surfaces provided by its excellent stability. The Arc’teryx Acrux FL took the final position, hampered by its stiff nature. Approach shoe design is challenging; hiking trails produce different needs than traversing or scaling slabs. Hiking with a pack demands stability, support, and protection (especially with heavier loads) while climbing requires sensitivity and flexibility. Stiff soles for stability, support and protection are at odds with the softer shoe needed for sensitivity while climbing. To further complicate matters, midsole stiffness improves edging but detracts from slab climbing. Indeed, there is a wide array of demands for the “perfect” approach shoe. Terrain, load, and personal preferences can steer the climber to one side of the hiking vs. climbing spectrum. Some areas, like Yosemite, demand a large amount of slab traversing to gain access to the start of the routes; climbing ability, particularly sticky soles, may drive decisions on approach shoes. As the load goes up (think trad climbing or aid climbing), or the approach grows longer, hiking ability may become the priority. Some climbers feel more unstable at the ankles hiking than they ever do climbing, and for those people, stability may be the key. Others feel unsure when walking along angled, smooth slabs, and for them, sticky, sensitive soles would be the central need. Climates can also affect material choices; leather uppers tend to be hotter, and they take longer to dry should it rain. Mesh uppers breathe better and dry faster, but provide little protection from wind and cold. Brands are filling the demand for approach shoes; every year more models are entering the market, so finding a shoe that meets the specific set of demands a climber may have is becoming more likely. Approach shoes are tested in terrain and conditions typical of rock climbing and gaining access to routes in the mountains. Loaded packs are carried on dirt trails, sometimes past treeline, to rocky slopes that guard the base of climbs. Some testing includes topping minor peaks to acclimatize for larger objectives. Hardpacked trails, loamy dirt, river crossings, slabby traverses and jagged boulder hopping could all be on the menu. Temperatures can run from freezing to as high a summertime temperature that the climber is willing to tolerate. Rain and light snow are also possible. Approach shoes also serve as camp shoes when operating out of a base camp for remote objectives. Support and stability are incredibly important, uneven surfaces and packs filled with gear can elicit trip ending injuries if an ankle is rolled or worse. Stability also lends confidence when negotiating tricky terrain with fall potential. Support is required for similar reasons, and for keeping the feet comfortable so that they remain in good condition for rock climbing. Protection from underfoot stones, jagged rocky protrusions and inevitable toe stubbing during the approach hike is essential to keep feet prepared for the actual climb. Protection from abrasion during foot jamming is also prudent. Rain, snow and cold can also be factors. Comfort is of utmost importance on long approaches that can stretch into multi-day affairs. Heavy loads of ropes and hardware compounding what the feet have to endure, both before and after being crammed into tight climbing shoes. Quality and construction rank high to climbers when evaluating gear, and approach shoes are no different. Climbers view them as essential gear. Failure in remote areas isn’t an option, and much of the perceived value of gear rides on durability, which is dependent on quality and construction. Performance is what drives much of the gear choices, and again, approach shoes are no different. The climber will need to determine the appropriate position on the hiking performance versus climbing performance spectrum, as the perfect approach shoe that excels equally in all areas hasn’t been developed. 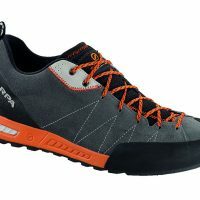 Currently, the makers of approach shoes must find their balance point between climbing ability and hiking ability. The sensitivity that produces confident travel across angled slabs enforces design constraints that limit protection and stability that challenging terrain and heavy loads demand. Much of this pivots around midsole stiffness. Perhaps the impact-sensitive compounds (materials that stiffen upon impact but remain pliable otherwise) will find their way into footwear. Until then, or when some other technology allows a stiff yet sensitive midsole, the best a brand can do is try to occupy as much of the hiking versus climbing performance spectrum as possible. Other factors also force choices amongst brands and climbers alike. Choosing a more weather resistant upper means more heat retention during the warmer months. Sticky rubber soles and low profile lugs/solid soles are confidence inspiring on the rock, but any moisture or looseness on dirt negates traction. Then there’s the fit: tighter fit enhances climbing feel but can be uncomfortable during the approach hike. Advances in design, materials, and technology, at best, may increase a model’s breadth of performance, but all other factors being equal, prioritizing hiking or climbing performance will be a pivot point in the purchasing decision.